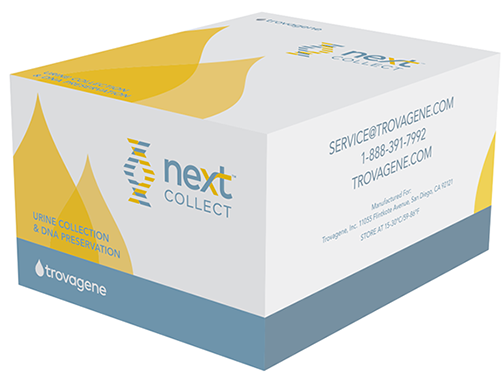 NextCollect urine collection and DNA preservation kit is now available, for research use only, to clinical research laboratories and pharmaceutical customers. NextCollect accommodates up to 250 mL of volume in its urine collection cup with a built-in delivery of a preservative fluid in the collection cup lid to maximize the amount of cfDNA collected in each urine sample, while minimizing total DNA degradation during transport and storage. The product is designed for high-throughput lab processing with the ability to fit directly into standard centrifuge systems for initial specimen DNA separation requirements. The company plans to make its DNA Isolation Buffer Kits available in early 2018 to complement the NextCollect collection applications. These kits support the isolation of pre- and post-renal cell-free DNA and RNA, using the methods developed with the Trovera ctDNA tests.